THE STORY - Raised by a family of wolves since birth, Mowgli (Neel Sethi) must leave the only home he's ever known when the fearsome tiger Shere Khan (Idris Elba) unleashes his mighty roar. Guided by a no-nonsense panther (Ben Kingsley) and a free-spirited bear (Bill Murray), the young boy meets an array of jungle animals, including a slithery python and a smooth-talking ape. 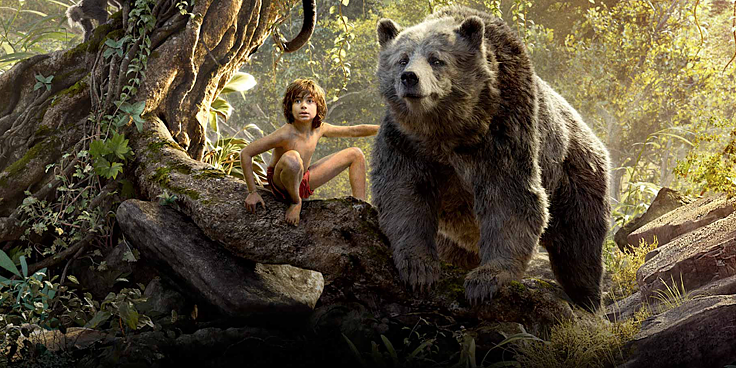 Along the way, Mowgli learns valuable life lessons as his epic journey of self-discovery leads to fun and adventure. THE GOOD - Unbelievable photorealistic effects and perfectly cast voice acting with Idris Elba being the standout. A story both kids and adults can feel good about. Borrowing the best elements from the 1967 Disney Animated Film and Rudyard Kipling's original stories, "The Jungle Book" represents what a live action Disney remake can be when done correctly and without all of the gothic influences from the mind of someone such as Tim Burton. Director Jon Favreau creates a film that pays respect to its source material and dazzles with its breathtaking CGI. It provides a wondrous film that both children and their parents can enjoy thanks to its sharp blend of tone and flawless voice casting. And although the animated film will always have its place, this is a film parents can feel good about raising their kids with. Mowgli (Neel Sethi) is a "man-cub" who has been raised in the Indian jungle by a pack of wolves since a young age. Led by Akela (Giancarlo Esposito) and his wife Raksha (Lupita Nyong'o), the pack consider Mowgli one of their own despite Mowgli's tendencies to use his ingenuity to navigate through the jungle obstacles like a man would. One day during the dry season, all of the animals gather around the Peace Rock to drink whatever water remains and the pack of animals is approached by a powerfully threatening tiger named Shere Khan (Idris Elba). He recognizes that the boy is dangerous and desires to kill him so that the threat of man can be extinguished from the jungle. Aided by a wise panther named Bagheera (Ben Kinglsey) and a lovable bear named Baloo (Bill Murray), Mowgli will have to leave the jungle and join the man village if he is to escape Shere Kahn. If there is one thing that director Jon Favreau gets right more so than anything else, it is the casting of the voice actors. Not only do voice talents such as Bill Murray and Idris Elba contribute greatly towards their characters (Elba, in particular, is so menacing in his delivery of Shere Khan, that the imposing tiger might just be one of my favorite villains of the year), but other talents in bit roles such as Scarlett Johansson who plays a deceptive snake named Kaa and Christopher Walken as a fun giant Orangutan named King Louie, all come together to form a truly diverse cast. The other element of the film that Favreau gets right is his use of CGI and the level of immersion that is created through the film's 3D. Imagine if you took the CGI wizardry that was used in "Life Of Pi" for the animals and proceeded to combine that with the detailed jungle setting of "Avatar," and you get 2016's "The Jungle Book." What struck me the most was the effects used to blur the lines between cartoonish (They are anthropomorphic animals after all) and realism, by incorporating the facial structures of the actors playing the animals on the animal's faces. The film strikes a great balance by being somewhat dark and mature in its thematic peril for the Mowgli character, yet retains the colorful sense of fun that made the animated movie timeless. While Favreau gets so much right with his telling of Kipling's story, I question his desire to incorporate two famous musical numbers from the 1967 animated film into this modern live action remake. It's the one point of the movie where the tone does not feel right and no matter how hummable the songs may be, they still don't manage to add anything to the film other than a feeling of nostalgia. And if there is one crucial element in any film that makes a huge difference, it is a film's musical score. While the events that are taking place on the screen are powerful and astonishing within their own right, the film's score by John Debney leaves much to be desired in terms of unique themes and swelling moments of size and scope. Jon Favreau has always been a fine director when it came to making accessible family films that everyone can enjoy. He does it again with "The Jungle Book" despite a few nitpicky flaws. It's certainly his most ambitious film yet and probably the most difficult of his career. When your only actor is an unknown child acting against a ton of green screen and yet you somehow manage to make it work, that's impressive. And how can I not give credit to Neel Sethi as Mowgli? He too is impressive and a terrific find. It's due to his performance that the film's narrative holds together and is able to create a respectful modern update to Kipling's story that utilizes nostalgia and today's greatest effects to create a new children's classic. "The Jungle Book" is a timeless tale that can be retold in many forms through different generations because at its core it's a film that is all about celebrating the individual that you are and finding your rightful place in the world.